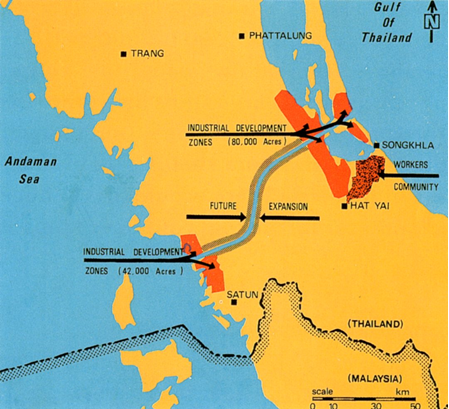 The Kra-Canal project, sometimes also called the Thai-Canal, is an ambitious plan that would create a connection between the South Chinese Sea on the East in the Gulf of Thailand with the Andaman Sea in the West by passing through Southern Thailand. This would shorten shipping distances by 1,200 Nautical miles around peninsular Malaysia and Singapore. Ships would avoid passing through the piracy risky area in the Strait of Malacca. The Strait of Malacca is one of the busiest shipping lanes in the world, with 60,000 passages annually. At the narrowest part of peninsular Thailand, in Kra Isthmus the width is only 44 kilometres, the challenge however is a mountain stretch which reaches 75 metres above sea-level. Therefore, most proposals for the Kra-Canal vary with lengths between 50 to 100 kilometres in order to minimise the excavation. The idea has always been to construct a sea-level canal without the use of sea-locks. If the canal would be able to accommodate vessels up to the size of 500,000 DWT and have the possibility of two lane traffic, with a transit speed of 7 knots (international navigational speed standard), it would require a canal with a depth of 33 metres and a bottom width of 500 metres. These impressive dimensions indicate clearly the enormous volumes that will need to be excavated. Historically the idea for the Kra-Canal has been launched several times over the past centuries. The earliest one dates back to 1677 when the French engineer De Lamar made a study ordered by the Thai king. In addition many other studies where made in the 18th and 19th Century. Among them even in 1882 the engineer of the Suez canal De Lesseps looked into this. In the 20th Century several other attempts surfaced with suggested funding from institutions as the World Bank, Japanese Global Infrastructure Fund and the Asian Development Bank. The most spectacular was a Japanese proposal to use so-called ‘nuclear excavation’, whereby nuclear devices are used for excavation. In 2005 ‘The Washington Post’ published a leaked internal report of defence secretary Donald Rumsfeld claiming that the Chinese are looking into funding and constructing the Kra-Canal. This raised concerns about Chinese influence and strategic investments in the region. In addition, the Singapore government has also voiced its opposition to the Kra-Canal as it would challenge the unrivalled and important position of Singapore as a major shipping hub in South East Asia. The Chinese plan to construct the Kra-Canal was budgeted at 25 billion US dollar and the construction would take 10 years and employ 30.000 construction workers. Initially the Thai government tentatively approved the Chinese plans in 2007. Until recently not much progress has been made, due to environmental concerns and mainly the political turmoil in Thailand. However in March 2014, the Chinese Newspaper ‘China Daily Mail’ reported: “China’s huge state-owned LiuGong Machinery Co. Ltd and XCMG, and private Sany Heavy Industry Co Ltd have taken the lead to set up a preparations group for the construction of Kra-Canal”. Vessels using the Suez Canal actually save approximately 6.400 Nautical miles by avoiding to circum-navigate around Africa, while vessels using the Panama Canal save approximately 7.800 Nautical miles by avoiding circum-navigating South-America. Therefore, it is questionable if the construction of the Kra-Canal would justify the huge investments and large scale construction and excavation, only to save around 1.200 Nautical miles in avoiding eclipsing peninsular Malaysia and Singapore. However, there is a much bigger picture behind the idea of the Kra-Canal. The Kra-Canal could be of an enormous economical benefit to Thailand and it could become a centre of gravity for trade between the Pacific and Indian Ocean. The plan is to develop an industrial zone for heavy industry, including dry-dock and ship-building facilities and a deep-sea port at the canal entrances. This would make the Kra-Canal the ideal and major transhipment port for Asia, comparable to Europort in Rotterdam. Will Chinese investments bypass the Malacca Strait with the Kra-Canal in Thailand?